It might be one of the last things you notice in a home, but it’s one of the most important. Your roof isn’t something you might take notice of regularly, but it’s the one thing that keeps your home and your belongings safe from the elements. Roofs are impossible to live without, and no new home is complete without a roof. However, even a brand new roof won’t last forever. Every roof requires replacement over the years. They now last longer than ever before, but they do come with a lifespan that does expire over time. Realizing you need a new roof comes in one of two stages. You realize that you are living in a home with an old roof that requires replacement in order for you to continue insurance coverage or you realize too late that there is a problem with your roof even though it’s not nearly as old as it needs to be for replacement. Of course, there are always those who remodel their home and decide to replace the roof for something more modern and more in their style. Installing GAF’s extra thick shingles on top of its patented TIGERPAW roof deck protection will give your home the extra protection it needs from nature’s forces. New roof installation is a process, but it doesn’t have to be stressful. At The Window Broker, our team of roofing experts is well-versed in recognizing roofs that need replacement, getting the job done and doing it so that it exceeds your expectations. 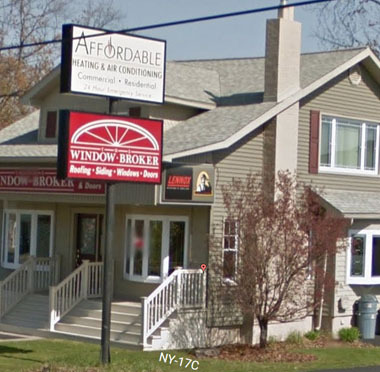 At The Window Broker, we work with only the best shingles in the business. GAF Timberline® American Harvest® Shingles shingles are manufactured to the highest standards, designed to last and come in a variety of designs and colors so that our customers find exactly what they need to match the style of their home. Shingles are some of the most popular roofing materials around for many reasons. A new roof installation project might be on the horizon for you, and that means you'll want to work with a company that has the experience and expertise to install your new roof correctly the first time. Not only does The Window Broker provide you with the best materials in the industry, we also provide you with the best in customer service and satisfaction. Leave it to our team of professionals to help you discover the roof of your dreams and have it installed faster and more efficiently than anyone else. Call us at The Window Broker at (607) 798-9954 or fill out the form online to schedule a free consultation with our roofing experts. From a free estimate to helping answer your questions to designing and installing your new roof, our team is with you from day one until we are finished and you are completely satisfied with our work. Call us today and schedule an appointment to have your new roof installed.